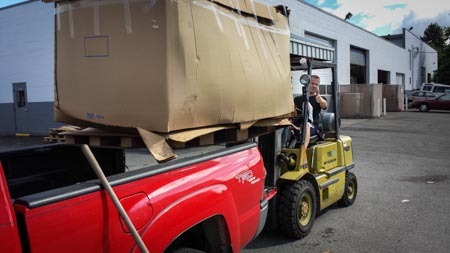 For the last two years, the Parts Receiving Office of Bill Pierre Ford in Lake City has loaded up leftover large cardboard pieces to Meadowbrook Community CARE. We appreciate Betsy and Alex for their help in loading, support in donating and willingness to keep our needs in mind. Although it is much easier to donate, the folks at Bill Pierre Ford like that they can do their part to help build the Meadowbrook Orchard. The cardboard is laid out in the orchard and then mulch from Seattle Parks is spread by volunteers. As the cardboard and mulch break down, it improves the soil and keeps weeds at bay. The Meadowbrook Annual Garden has also used the donation in establishing the new garden beds next to the Nathan Hale HS tennis courts. Thank you Alex, Thank you Betsy!